The city of Kanchanaburi (in Thai: กาญจนบุรี) is also the capital of the province of the same name. 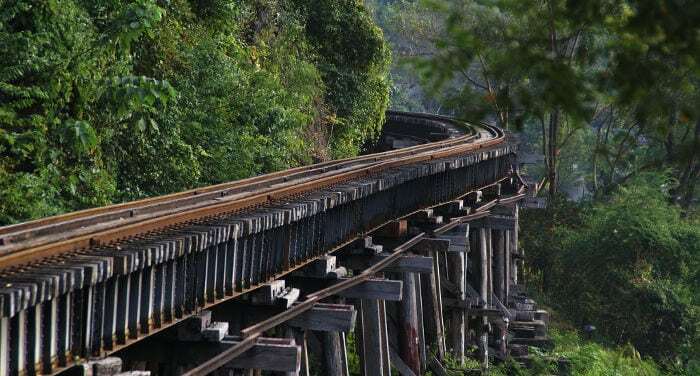 Located about 120 kilometers west of Bangkok, Kanchanaburi is especially famous among international tourists for the “Railway of Death” and the “Tiger Temple”. The town has a little more than 30,000 inhabitants, and rises up along the shores of the intersection of the Kwai Noi and Kwai Yai Rivers. The best time to visit the city (as with the rest of Thailand), is from November to the end of March, when the weather is drier and it hardly ever rains. Nevertheless, just like Bangkok, in Kanchanaburi too the average yearly temperatures can pass 30 degrees, making almost any daytime activity quite tiresome. The worst time is definitely between April and October when the rains are persistent and the humidity is through the roof. Kanchanaburi first started becoming a popular destination toward the beginning of the 60’s thanks to the trials and tribulations of the Second World War.